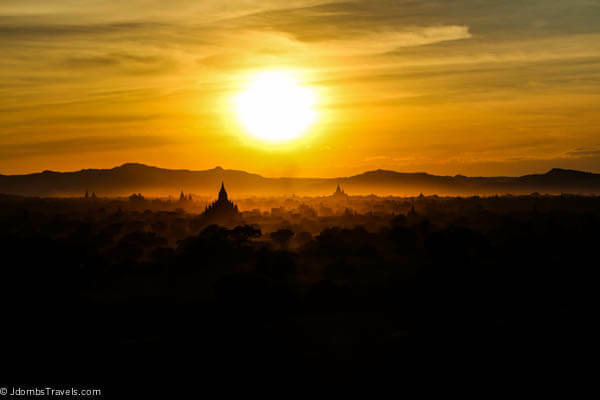 Watching the sunset from atop a temple is a MUST when visiting Bagan! The sun sets behind the mountains and the Irrawaddy River and you can position yourself so that the stupas create black silhouettes or you can choose to have the sun behind you so that it lights up the pagods in shades of pink and gold. There are a number of temples that you can climb at sunset. 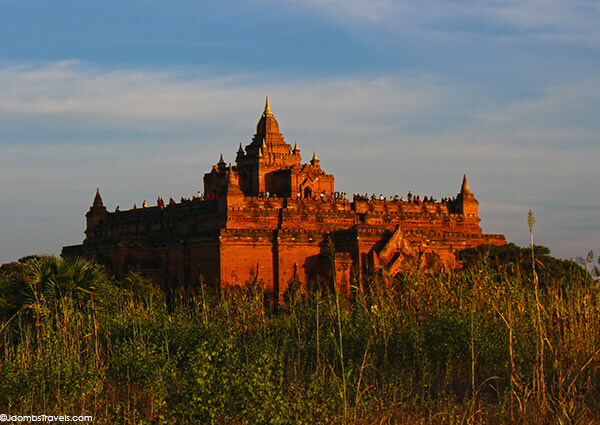 Ananda and Shwesandaw are the most popular and always overcrowded since most of the coach tours take tourists to these spots for the breathtaking Bagan sunset. We opted to head east to Pyathadar Temple, which our pilot had pointed out as a great spot to watch the sunset from on our sunrise balloon flight over Bagan that morning. It’s the farthest to the east and with a pagoda field in front of it. The temple is a flat-topped temple with plenty of space on the large terrace to find a spot to watch the sunset, unlike some of the others with narrow walkways which increase the crowding. We had the temple to ourselves when we arrived about an hour before sunset. The climb up the pagodas isn’t for the faint of heart. 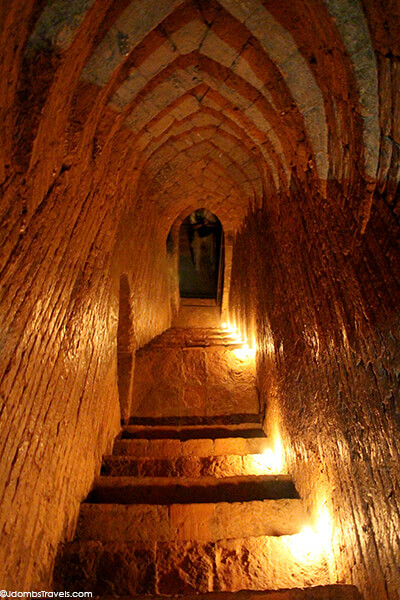 The stairways are narrow and only lit by faint candlelight, if lit at all. They are also steep, though the view makes the heart pounding climb worth it! Can you spot me atop the Pyathadar Temple? After a 3am wake-up call for ballooning and then e-biking around to pagoda after pagoda, it was nice to just dangle my bare feet (or can’t wear shoes or socks inside the temples) over the edge and just take it all the stupas dotting the landscape before us. It’s surreal. We hardly saw another soul at many of the pagodas we visited e-biking around the archaeological sight. We had sandy paths entirely to ourselves. 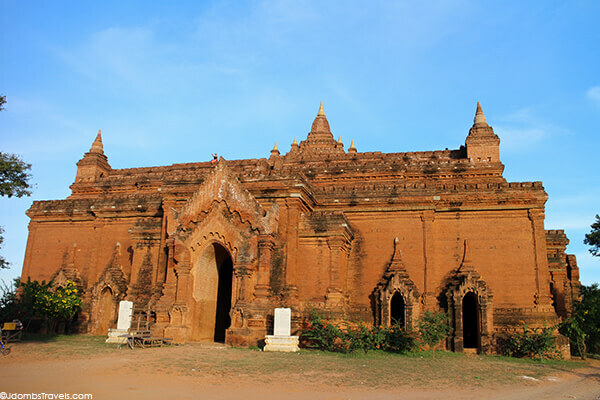 But slowly as we sat waiting from the sun to set, it was like the whole of Bagan was descending upon Pyathadar Temple. The sight actually became quite comical and I wish we’d capture the scene on video. 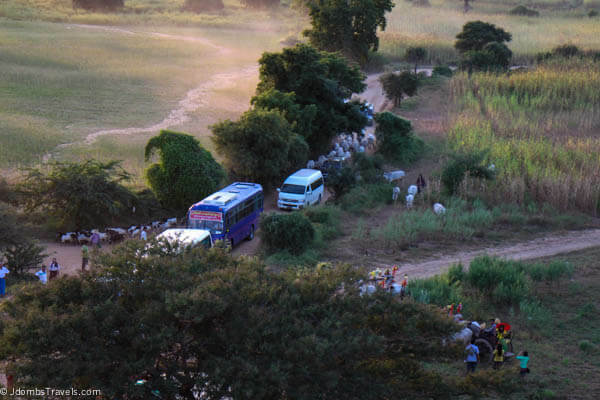 First, goat and cow herders came herding their flocks in for the night. Soon a few coaches and private cars carried tourists effortlessly toward us. And don’t forget the horse carts, which is still a popular way to get around the site. 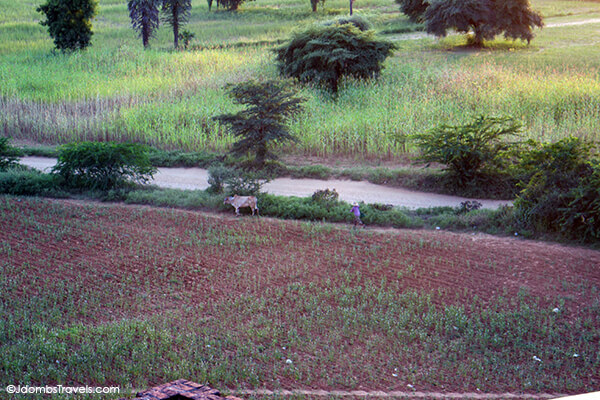 Tim and I laughed hysterically as a cow got stressed out by the madness and broke away from the herd and a Burmese woman went chasing frantically after her stray cow. Even as people gathered on the terrace with us, it never felt crowded though. And no matter language barrier or walk of life, we were all about to share one of the most spectacular sights I’ve ever witnessed. A hush fell over everyone as the sinking sun turned the sky brilliant shades of gold, the pagodas nothing but black silhouettes. The mist coming off the Irrawaddy River just added to the mysteriousness of it all. Once the sun dipped behind the mountains, it was an entirely different scene. The sky suddenly was like a painting with streaks of pinks, oranges and purples. The sky seemed to be changing by the minute and we hardly wanted to tear ourselves away. The key holder to the temple had to finally herd us out and we were one of the very last to leave. Just as fast as the crowds had descended upon Pyathadar Temple, they vanished and we were left alone again with our e-bikes and the temples. Thanks for the post. Burmas temples intrigue me and its high up there on my places to vist next! Wow, the sunrise looks spectacular. I’d love to be able to see something like that and there! That is totally worth getting u pat 3 AM for! Gorgeous, love all the photos! Amazing! Bagan’s my number one destination right now. I love your photos so much. Thanks Bram! You will love it! We want to go back and see more of the country. 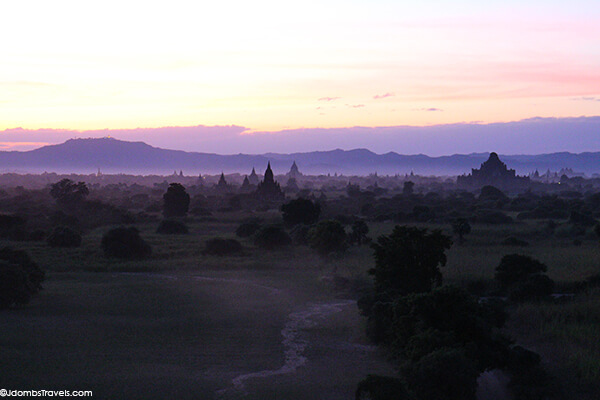 Myanmar is in our top 5 favorite destinations now. The colours in some of your photos are amazing. I love it when the sunset casts that orange glow over everything! Thanks Ari! The array of colors from sunset were amazing. Definitely one of the best sunsets we’ve experienced anywhere in the world. I think the locals are used to the e-bikes already. From talking with people, they had gotten e-bikes a few months before we were there. Those pictures are lovely, sounds like it was well worth getting up insanely early! It definitely was worth the long day for both sunrise and sunset photos. 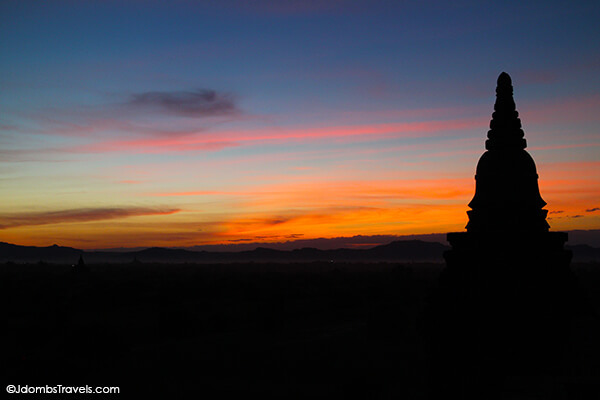 Bagan is amazing and one of our favorite places we’ve been. Thanks, Jaryd! Tim gets all the credit for the photography. 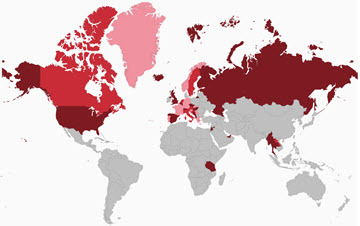 I just stumbled across your site while doing research for our trip to Cambodia and Burma later this year. Your information is wonderful and if I wasn’t already excited beyond description, this would’ve done it! We are going to celebrate my 50th birthday and, assuming the weather cooperates, ballooning over Bagan will be how I start the day, and the sunset from a temple will be how I end it. Thanks for the good advice about how to avoid (some of) the crowds! 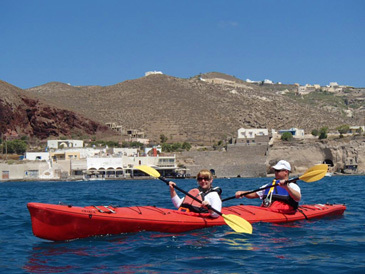 What a great place to spend your birthday, Susan! 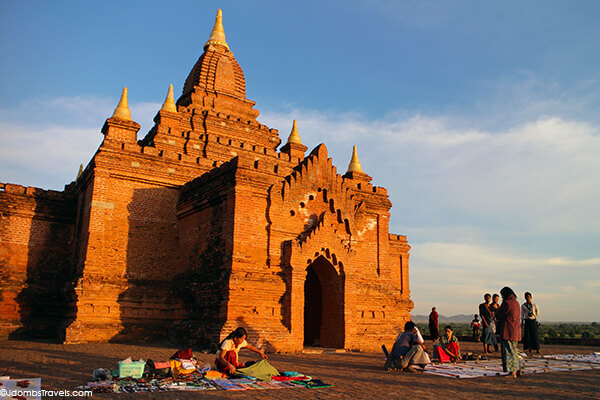 Bagan is a great choice for ballooning since the weather is so stable there. You’ll have a fantastic trip!